Although included in many Anglican calendars around the world, Saint Lucy (the English translation of Santa Lucia) is not particularly well-known or popular among Episcopalians, General Convention only recently added her to our calendar, but she is a gem that I hope we embrace. Here in America, Lucy is much more celebrated among Scandinavian Lutherans. My mom’s parents were Scandinavian (Swedish mom and Norwegian dad) so I grew up celebrating Lucy and now continue those traditions with my children. What we know about the historic Lucy is quite limited: she was an Italian Christian martyred during the Diocletian persecution of 304 CE. That’s basically it. But stories and legends abound. There are stories of her refusing to offer sacrifices to the emperor, of giving away her dowry to the poor, and of resisting marriage so she could commit herself to Christ. As one might expect for a martyr, some of these of these stories are rather graphic and bloody. I warn you that if you look for images of Saint Lucy, you will find several with her holding her eyeballs on a platter. Needless to say, I am judicious of the age and sensitivity of the listeners when deciding which stories to share. 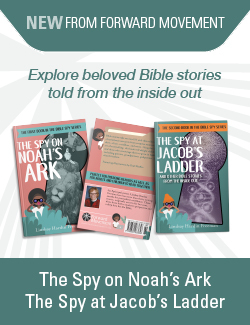 At the core of all of the stories and legends of Lucy, however, are the virtues of faith, courage, and generosity. There is one legend I never fail to tell that comes from my Scandinavian ancestors. In order to understand this story, you must remember that the old Julian calendar did not fully take into account the precise length of a trip around the sun, so the calendar slowly drifted. It had drifted so far by the late Middle Ages that the shortest day of the year was December 13th, the Feast of St. Lucy. The legend goes that there was a famine in a Swedish village and the people were running low on food. Survival through the winter was unlikely. On December 13th, that longest night of the year, when the food had run out and it seemed like all hope was lost, townsfolk saw a light coming. As the light approached, they could begin to make out what it was: a young woman with candles on her head. It was Lucy! And she brought enough food to save the people that winter! This is the Lucy we know and celebrate in my family every year. Growing up, I have fond memories of bringing breakfast in bed to Mom on Saint Lucy’s day. I remember going to the local Swedish heritage lodge in Raleigh, North Carolina for a Saint. Lucy party. My brother and I dressed as star boys and my sister dressed in the traditional white robe with a wreath on her head. When I had children, I wanted to celebrate Lucy with them. 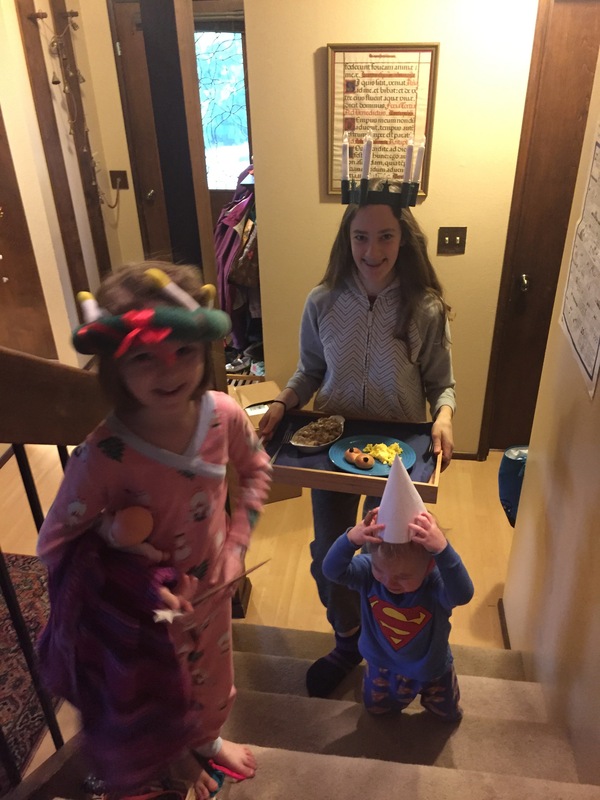 I wake the eldest up early and we bake Saffransbullar – a traditional saffron sweet bread eaten on St. Lucy’s day – and then the other kids join us to bring the bread to my wife in bed. Traditionally, the Lucia bride wears candles on her head, but that does not seem particularly safe, so I found a wreath with electric candles and another made from fabric. We happened to have a star wand for my son and made a simple Star Boy hat (which looks a bit like a dunce cap). I tell stories about Lucy, both the historic Lucy and always the Scandinavian legend, too. The eldest child making safransbullar. This King Arthur recipe works quite well. The children carrying breakfast to mom in bed. The Book of Common Prayer calls saints “the lights of the world in their generations” (p.380). The ongoing legends of Lucy remind us that the prayer book has that half right: Saints are lights in future generations as well. Lucy meant something to Roman Christians undergoing persecution in the 4thcentury, to Scandinavian Christians living in great darkness a thousand years later, and to many Christians today. The name Lucy means light. She is a light, but more importantly she points us to the light of Christ. In the literal darkness we face every year at this time and in the greater darkness we face in our lives and in the world, Lucy reminds us that the light of Christ shines in the midst of it all, and the darkness does not overcome it. Love this so much! 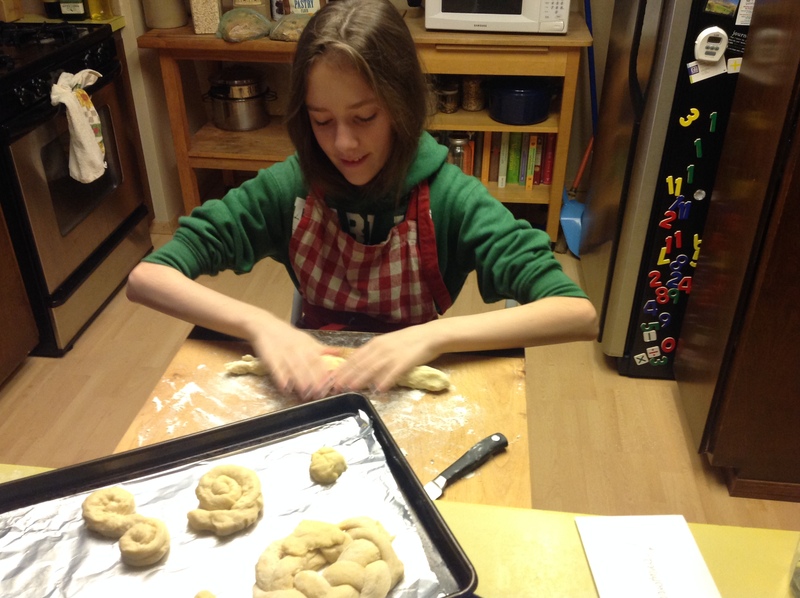 So interesting to hear your family’s traditions and see your kids making the saffron buns! I’ll be honest, I’ve never made the saffron buns myself because saffron seems so expensive where I’ve found it! Im curious if it was always that case, seems like it wouldnt be if everyone was making saffron buns! 🙂 Great article and pics!~ God Jul! Saffron is a bit spendy, but we only make this once a year, so consider it a special treat. There is a powdered saffron that is a bit less expensive. I picked some up in the Holy Land a few years ago and that has lasted us for quite a while! This is lovely, thanks for sharing your family’s traditions. I love the story about the Swedish village and Lucy bringing food; it is new to me. A Swedish friend shared with me that every year they ask their St. Lucy “Why do you wear your lights on your head?” And she responds “So that I can use both hands to serve others.” We have a very simple tradition of rolls for breakfast (I dont’ have a girl to be St. Lucy), but I do always ask the boys why Lucy wears her lights on her head. Thank you, Emily! I hadn’t heard the idea about the candles on the head being to free up the hands to serve. That is so lovely! Happy St. Lucy’s Day! I am glad you include your boys in it. I think Lucy is as much a model for our sons as our daughters! !